Feb 07, 2019 by Jodie Kim	in New! Turn to Hardy in any alphabetical order and you find: ‘See Stan Laurel’. Stan & Ollie starts in 1937, with the duo near their commercial peak on the set of Way Out West. But this prologue is brief: most of the picture depicts their tour of Britain and Ireland in 1953. That sounds very late for Laurel & Hardy, whose first film was 1927. Were they really still performing in the age of James Dean? This surprise is recurrent within the film, where most of the Britons who meet them can’t believe they’re still going. It seems that this tour was their last act: a final caption says that they never performed again after it. They are looking to make a film about Robin Hood, but finance for this is scuppered along the way. (Their last film was actually Robinson Crusoeland, made in France and released in 1951.) So the film is about these artists’ late period (but hardly ‘late style’: they are reprising old familiar manners and gags on stage), about ending, and maybe looking for a way to end well. The actors are notably accompanied by their wives: Shirley Henderson solid I suppose as Lucille Hardy, but Nina Arianda more of a show-stealer as Ida Kitaeva Laurel, fabulously brusque and matter-of-fact in her dealings with others and always ready to recall again, in Russian-tinted English, her work with Preston Sturges and Harold Lloyd. Biopics of actors and artists are common, a BBC4 subgenre. Perhaps this film abuts that, but it feels a very superior instance. With the sense of history comes rich colour: brown or blue suits, wooden panels. I found something deeply compelling about simply seeing Steve Coogan as Laurel and, especially, John S. Reilly as Hardy. Perhaps it’s because they are so visually distinctive yet have been relatively out of sight for so long; I don’t know when I last saw anyone else try to play them, and rarely in recent years have I caught sight of footage of Laurel & Hardy themselves. So a powerful image is suddenly restored to view. At the end, they spontaneously dance on stage for a last time and we see their synchronised movement from below, white spotlight shining beyond the black suits, bowler hats in silhouette: very poignantly, hard at work, they become their own icon. Then there is the quality of performance here. Watching the film, I came to find deep sympathy with a particular physical attitude of Laurel’s: one in which he shuffles, embarrassed, apologetic, crosses his legs this way and that, looks away, raises his eyebrows and furrows his brow in mild despair, makes half a gesture, wants to explain why he isn’t in the wrong as has been suggested but can’t see an effective way to begin to make such an explanation, so opens his mouth then falls silent again in modest frustration. A bundle of recognizable feelings and responses are conveyed by these mannerisms of Laurel’s. Yet I wasn’t even watching Laurel: it was Steve Coogan imitating Laurel. That suggests how fine Coogan’s rendition can be. His voice at least catches the main notes of Laurel’s too: a Mancunian playing a Cumbrian, if one who’s spent a long time in Hollywood. Yet Coogan, notwithstanding the performance, doesn’t happen to look just like Laurel. In this regard Reilly is astounding: watching him really feels like watching Oliver Hardy. And listening to him sounds even more remarkably like listening to Oliver Hardy. The voice drawls so richly, savours its vowels at such length – even when Hardy is just being himself, not playing for an audience – that I was distracted into wondering where he was from. Harlem, Georgia, it turns out: the Deep South. That impersonation can be more entertaining than acting is an idea demonstrated at length in Coogan’s series of restaurant tours with Rob Brydon, The Trip – which started, in 2010, not far from where Stan Laurel started life. 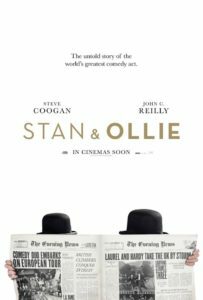 I don’t think that Coogan’s presence in Stan & Ollie can have been primarily prompted by The Trip, which makes the film’s echo of that programme uncanny: two comedians on the road, dining, bickering, remembering their past, falling out and grudgingly reuniting. But this is like The Trip writ large, as if one of its impressions had taken over and rewritten the whole series, so that every episode concerned, say, Coogan as Peter Sellers and Brydon as Alan Bennett, never out of role, in fact reprising the actual lives of Sellers and Bennett. More simply, what Laurel & Hardy here share with Coogan and Brydon is a readiness to play as they go, to repeat old material for fun (though Coogan in The Trip rarely seems to find enough fun in it). One of the film’s most charming features is the way Laurel & Hardy, but especially Laurel, will drop their own comic lines into conversation, or talk to people, including each other, as though they were in a Laurel & Hardy film. When Laurel, attending to business, is asked where Hardy is, he responds that his partner has a new job in a Swiss cheese factory – putting the holes in. In a separate scene, Hardy is asked the equivalent question, and he instantly replies that Mr Laurel has a new job putting broken biscuits back together. It’s almost too touching that they refer to each other this way, each describing the other in the terms of the gentle, silly comedy they had perfected, each innocent of the other’s doing it. In another early scene, they arrive at a hotel in Newcastle and fall over themselves bringing the luggage in, then engage in a minute of business grabbing and banging the bell for reception – with Hardy motioning to the receptionist and telling Laurel in his slow, exasperated screen mode: Can’t you see she’s right here? It is hard to gauge the scene’s intention: is it that this Laurel & Hardy naturally behave this way because that’s the way they are? Or that they can’t help behaving this way after decades of performance? Or that they are actually, jointly but tacitly, producing a deliberate performance for this audience of one? I think it’s the last. A few hours before seeing Stan & Ollie, I happened to read an article by David Thomson concerning Daniel Day-Lewis’s retirement from acting, in the conceit of an open letter to Day-Lewis himself. Thomson suggests that there can be no absolute retirement, for Day-Lewis will have discovered that performance goes all the way down: retired, ‘you have entered into the inner circuit of acting, the no-escape task of playing yourself, in improv, with no text to learn, wearing your own clothes, carrying sets and decor around with you like an aroma’. In much of Thomson’s writing on these matters, there is a sense that performance is a prison; that cinema has condemned humanity to self-consciousness. But a pleasure of Stan & Ollie is the characters’ gentle refusal to see acting this way: their willingness to play themselves, relishing their personas, cheerfully making their comic style a way of life.